Disk, box & book in good condition. TESTED: All my sale item are either tested or new. 1 x Playstation 3 Brink. item is in great condition with box instruction leaflet included. instruction leaflet included. BEFORE you buy the item as extra costs can be incurred for a different service. We check our competitors?. We Do Not Honour ?. Retro Toys. Retro Collectables. Modern Toys. Due to the nature of our goods being used, mistakes can happen. None of our toys are suitable for children under 36 months due to small parts. Very good condition, tested and working. Playstation 3 disc for Sony playstation. Perfect Condition see photos of disc. 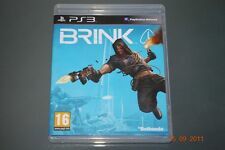 Brink Video Game for Sony Playstation 3 - DISC ONLY MINT. Condition is Very Good. Dispatched with Royal Mail 1st Class Large Letter.